California-based startup Snappr, an on-demand professional photography service, is expanding into the Spokane market with an official launch Monday. Snappr, described as the Uber of photography, connects customers to a professional photographer via its app or website to book photo shoots for events such as birthday parties, weddings, portraits, sightseeing excursions and corporate events, said Matt Schiller, CEO of Snappr. Customers can book a photographer within a two-hour window that same day or more than 12 hours in advance. Prices start at $59 for a 30-minute photo session and go up to $449 for an all-day shoot. Once customers book a photo shoot, Snappr will match them with a photographer based on their specialization and location. The photographer will then contact the customer to confirm details and arrive at the chosen location with cameras and lighting gear. Photographers upload the photos to the Snappr platform, where they’re available to customers within 48 hours of the shoot. Photography businesses in Spokane generate more than $19 million annually and an estimated 174 paid photo shoots occur per day, according to data from IBISWorld, a market research firm. Snappr, which Schiller calls “the largest marketplace for getting a photographer on demand in the U.S.,” originated in Sydney, Australia. The startup relocated to San Francisco in 2016 when it received backing from Y Combinator, a seed accelerator in the Bay Area that has funded successful startups such as Dropbox, Airbnb, DoorDash and Reddit. The idea for Snappr was derived from Gowntown, an Australian e-commerce business co-founded by Schiller that sells graduation gowns and frames. Finding that graduation photos were often expensive, he integrated a service into GownTown to connect photographers with graduates seeking pictures of their special day. After Snappr secured more than $2 million in seed funding in 2017 from investors such as AirTree Ventures; Lars Rasmussen, co-founder of Google Maps; and Justin Waldron, co-founder of Zynga, the startup expanded its platform to San Diego, Los Angeles, Portland and Seattle. Spokane was on the Snappr’s radar because it received a lot of interest from customers here using its separate, free photo analyzer service for LinkedIn and Tinder profile pictures, he said. Snappr aims to make professional photography affordable for customers while reducing administrative work for photographers, who receive 70 percent of a booking fee. Schiller said his goals for Snappr include expanding the platform to more major cities in the U.S. as well as internationally, and adding more photographers. It launched in Boulder, Colorado earlier this month. Snappr, which has about 1,000 photographers on its platform, is “highly selective” with photographers, accepting about 5 percent of those who apply, Schiller said. “In Spokane, we’ve got a handful of photographers on board and we’ll be adding more photographers as we start to get the kind of demand we expect to see,” Schiller said. Jeff Cummings, owner of photography business K-tizo, is one of the first Spokane-based photographers to join the platform. 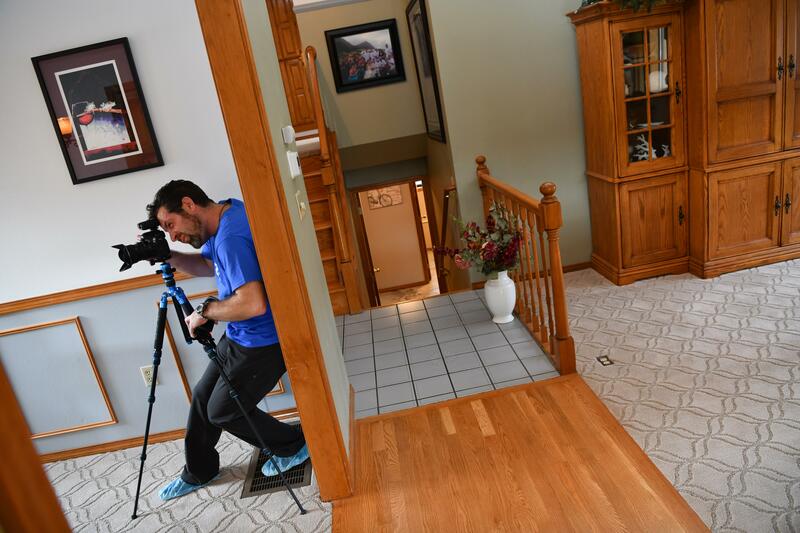 “It’s been challenging to market and get new clients and so I was doing some exploring online and discovered Snappr, which I’ve never heard of before,” said Cummings, who specializes in real estate photography. Cummings completed an application, video interview and provided his portfolio to Snappr. He was accepted on the platform a week later. “I joined because I felt they offered a real good value to a photographer like myself and I would be able to spend more time being creative and doing photography that I’m passionate about and less time trying to market my company,” he said. Cummings said he’s excited about Snappr’s launch in Spokane and its potential to be a recognized source for photography services.